Local and regional leaders of Equity Bank visit and invest in Independence Community College’s Fab Lab on Thursday, September 13, to demonstrate the company’s support for innovative thinking and entrepreneurial development in southeast Kansas. 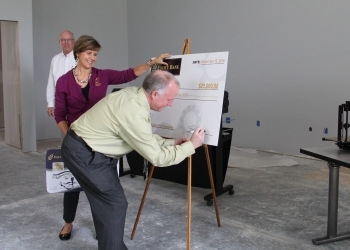 During a brief ceremony conducted under construction work lights in the nearly finished Fab Lab expansion building, the Equity team presented a “giant” check representing the institution’s 25-thousand-dollar pledge to support the project. Fab Lab Director Jim Correll and Manager Tim Haynes were joined by ICC President Dan Barwick to receive the donation. Correll acknowledged Equity’s gift as an investment in the future economic health of the community. The 64-hundred-square-foot Fab Lab expansion building will officially open October 1, four years to the day after the original facility opened in 2014. The public is invited to a Grand Opening Celebration from 12 noon to 7 p.m. October 1, with a ribbon cutting ceremony at 12:15 p.m. Refreshments and tours will be offered, as well as more information on Fab Lab membership. The new building will expand the Fab Lab’s “maker” resources for students, entrepreneurs, small businesses and hobbyists. The new space will accommodate a state-of-the-art paint booth and welding stations, collaborative workspace for entrepreneurs and a fully equipped digital design studio, which will be named in honor of the Equity Bank gift. The studio will house vinyl cutting and multiple printing modalities, including 3D printing, wide media/banner printing and advanced laser printing.